I added the pictures Risuku (Chris) sent me to the game. Can we send you a pic of some enemys if we find one? 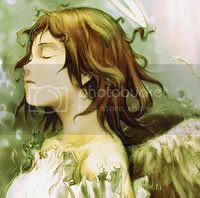 *Is currently wanting the Haibane Renmei dvds* .~. This is a great addition!!! It's fun to see what's going to pop up next.. thank you guys for doing this!!! Some of them crack me up. haha yeah, i had no clue who that was so i just found something funny! Why doesn't it show up when you search suicidally? May I use this picture for lonestrider wannabe? Are they the cause of the server downtime?